This article is about the bacterium. For the infection, see tuberculosis. M. tuberculosis is part of a complex that has at least 9 members: M. tuberculosis sensu stricto, M. africanum, M. canetti, M. bovis, M. caprae, M. microti, M. pinnipedii, M. mungi, and M. orygis. It requires oxygen to grow, does not produce spores, and is nonmotile. M. tuberculosis divides every 15–20 hours. This is extremely slow compared with other bacteria, which tend to have division times measured in minutes (Escherichia coli can divide roughly every 20 minutes). It is a small bacillus that can withstand weak disinfectants and can survive in a dry state for weeks. Its unusual cell wall is rich in lipids such as mycolic acid and is likely responsible for its resistance to desiccation and is a key virulence factor. Other bacteria are commonly identified with a microscope by staining them with Gram stain. However, the mycolic acid in the cell wall of M. tuberculosis does not absorb the stain. Instead, acid-fast stains such as Ziehl-Neelsen stain, or fluorescent stains such as auramine are used. Cells are curved rod-shaped and are often seen wrapped together, due to the presence of fatty acids in the cell wall that stick together. This appearance is referred to as cording, like strands of cord that make up a rope. M. tuberculosis is characterized in tissue by caseating granulomas containing Langhans giant cells, which have a "horseshoe" pattern of nuclei. M. tuberculosis can be grown in the laboratory. Compared to other commonly studied bacteria, M. tuberculosis has a remarkably slow growth rate, doubling roughly once per day. Commonly used media include liquids such as Middlebrook 7H9 or 7H12, egg-based solid media such as Lowenstein-Jensen, and solid agar-based such as Middlebrook 7H11 or 7H10. Visible colonies require several weeks to grow on agar plates. It is distinguished from other mycobacteria by its production of catalase and niacin. Other tests to confirm its identity include gene probes and MALDI-TOF. Humans are the only known reservoirs of M. tuberculosis. A misconception is that M. tuberculosis can be spread by shaking hands, making contact with toilet seats, sharing food or drink, sharing toothbrushes, or kissing. It can only be spread through air droplets originating from a person who has the disease either coughing, sneezing, speaking, or singing. When in the lungs, M. tuberculosis is phagocytosed by alveolar macrophages, but they are unable to kill and digest the bacterium. Its cell wall prevents the fusion of the phagosome with the lysosome, which contains a host of antibacterial factors. Specifically, M. tuberculosis blocks the bridging molecule, early endosomal autoantigen 1 (EEA1); however, this blockade does not prevent fusion of vesicles filled with nutrients. Consequently, the bacteria multiply unchecked within the macrophage. The bacteria also carry the UreC gene, which prevents acidification of the phagosome. In addition, production of the diterpene isotuberculosinol prevents maturation of the phagosome. The bacteria also evade macrophage-killing by neutralizing reactive nitrogen intermediates. Protective granulomas are formed due to the production of cytokines and upregulation of proteins involved in recruitment. Granulotomatous lesions are important in both regulating the immune response and minimizing tissue damage. Moreover, T cells help maintain Mycobacterium within the granulomas. The ability to construct M. tuberculosis mutants and test individual gene products for specific functions has significantly advanced the understanding of its pathogenesis and virulence factors. Many secreted and exported proteins are known to be important in pathogenesis. Aerolysin is a virulence factor of the pathogenic bacterium Aeromonas hydrophila. Resistant strains of M. tuberculosis have developed resistance to more than one TB drug, due to mutations in their genes. Typing of strains is useful in the investigation of tuberculosis outbreaks, because it gives the investigator evidence for or against transmission from person to person. Consider the situation where person A has tuberculosis and believes he acquired it from person B. If the bacteria isolated from each person belong to different types, then transmission from B to A is definitively disproved; however, if the bacteria are the same strain, then this supports (but does not definitively prove) the hypothesis that B infected A. Until the early 2000s, M. tuberculosis strains were typed by pulsed field gel electrophoresis (PFGE). This has now been superseded by variable numbers of tandem repeats (VNTR), which is technically easier to perform and allows better discrimination between strains. This method makes use of the presence of repeated DNA sequences within the M. tuberculosis genome. Three generations of VNTR typing for M. tuberculosis are noted. The first scheme, called exact tandem repeat, used only five loci, but the resolution afforded by these five loci was not as good as PFGE. The second scheme, called mycobacterial interspersed repetitive unit, had discrimination as good as PFGE. The third generation (mycobacterial interspersed repetitive unit – 2) added a further nine loci to bring the total to 24. This provides a degree of resolution greater than PFGE and is currently the standard for typing M. tuberculosis. However, with regard to archaeological remains, additional evidence may be required because of possible contamination from related soil bacteria. Antibiotic resistance in M. tuberculosis typically occurs due to either the accumulation of mutations in the genes targeted by the antibiotic or a change in titration of the drug. M. tuberculosis is considered to be multidrug-resistant (MDR TB) if it has developed drug resistance to both rifampicin and isoniazid, which are the most important antibiotics used in treatment. Additionally, extensively drug-resistant M. tuberculosis (XDR TB) is characterized by resistance to both isoniazid and rifampin, plus any fluoroquinolone and at least one of three injectable second-line drugs (i.e., amikacin, kanamycin, or capreomycin). The genome of the H37Rv strain was published in 1998. Its size is 4 million base pairs, with 3,959 genes; 40% of these genes have had their function characterised, with possible function postulated for another 44%. Within the genome are also six pseudogenes. The genome contains 250 genes involved in fatty acid metabolism, with 39 of these involved in the polyketide metabolism generating the waxy coat. Such large numbers of conserved genes show the evolutionary importance of the waxy coat to pathogen survival. Furthermore, experimental studies have since validated the importance of a lipid metabolism for M. tuberculosis, consisting entirely of host-derived lipids such as fats and cholesterol. Bacteria isolated from the lungs of infected mice were shown to preferentially use fatty acids over carbohydrate substrates. M. tuberculosis can also grow on the lipid cholesterol as a sole source of carbon, and genes involved in the cholesterol use pathway(s) have been validated as important during various stages of the infection lifecycle of M. tuberculosis, especially during the chronic phase of infection when other nutrients are likely not available. About 10% of the coding capacity is taken up by the PE/PPE gene families that encode acidic, glycine-rich proteins. These proteins have a conserved N-terminal motif, deletion of which impairs growth in macrophages and granulomas. Nine noncoding sRNAs have been characterised in M. tuberculosis, with a further 56 predicted in a bioinformatics screen. In 2013, a study on the genome of several sensitive, ultraresistant, and multiresistant M. tuberculosis strains was made to study antibiotic resistance mechanisms. Results reveal new relationships and drug resistance genes not previously associated and suggest some genes and intergenic regions associated with drug resistance may be involved in the resistance to more than one drug. Noteworthy is the role of the intergenic regions in the development of this resistance, and most of the genes proposed in this study to be responsible for drug resistance have an essential role in the development of M. tuberculosis. The M. tuberculosis complex evolved in Africa and most probably in the Horn of Africa. In addition to M. tuberculosis, the M. tuberculosis complex (MTBC) has a number of members infecting various animal species, these include M. africanum, M. bovis (Dassie's bacillus), M. caprae, M. microti, M. mungi, M. orygis, and M. pinnipedii. This group may also include the M. canettii clade. These animal strains of MTBC do not strictly deserve species status, as they are all closely related and embedded in the M. tuberculosis phylogeny, but for historic reasons, they currently hold species status. The M. canettii clade — which includes M. prototuberculosis — is a group of smooth-colony Mycobacterium species. Unlike the established members of the M. tuberculosis group, they undergo recombination with other species. The majority of the known strains of this group have been isolated from the Horn of Africa. The ancestor of M. tuberculosis appears to be M. canettii, first described in 1969. The established members of the M. tuberculosis complex are all clonal in their spread. The main human-infecting species have been classified into seven lineages. Translating these lineages into the terminology used for spoligotyping, a very crude genotyping methodology, lineage 1 contains the East African-Indian (EAI), the Manila family of strains and some Manu (Indian) strains; lineage 2 is the Beijing group; lineage 3 includes the Central Asian (CAS) strains; lineage 4 includes the Ghana and Haarlem (H/T), Latin America-Mediterranean (LAM) and X strains; types 5 and 6 correspond to M. africanum and are observed predominantly and at high frequencies in West Africa. A seventh type has been isolated from the Horn of Africa. The other species of this complex belong to a number of spoligotypes and do not normally infect humans. Lineages 2, 3 and 4 all share a unique deletion event (tbD1) and thus form a monophyletic group. Types 5 and 6 are closely related to the animal strains of MTBC, which do not normally infect humans. Lineage 3 has been divided into two clades: CAS-Kili (found in Tanzania) and CAS-Delhi (found in India and Saudi Arabia). Lineage 4 is also known as the Euro-American lineage. Subtypes within this type include Latin American Mediterranean, Uganda I, Uganda II, Haarlem, X, and Congo. A much cited study reported that M. tuberculosis has co-evolved with human populations, and that the most recent common ancestor of the M. tuberculosis complex evolved between 40,000 and 70,000 years ago. However, a later study that included genome sequences from M. tuberculosis complex members extracted from three 1,000 year old Peruvian mummies, came to quite different conclusions. If the most recent common ancestor of the M. tuberculosis complex were 40,000 to 70,000 years old, this would necessitates an evolutionary rate much lower than any estimates produced by genomic analyses of heterochronous samples. There are currently two narratives existing in parallel regarding the age of MTBC and how it has spread and co-evolved with humans through time. One study compared the M. tuberculosis phylogeny to a human mitochondrial genome phylogeny and interpreted these as being highly similar. Based on this, the study suggested that M. tuberculosis, like humans, evolved in Africa and subsequently spread with anatomically modern humans out of Africa across the world. By calibrating the mutation rate of M. tuberculosis to match this narrative, the study suggested that MTBC evolved 40,000 – 70,000 years ago. Applying this time scale, the study found that the M. tuberculosis effective population size expanded during the Neolithic Demographic Transition (around 10,000 years ago) and suggested that M. tuberculosis was able to adapt to changing human populations and that the historical success of this pathogen was driven at least in part by dramatic increases in human host population density. It has also been demonstrated that after emigrating from one continent to another, a human host’s region of origin is predictive of which TB lineage they carry, which could reflect either a stable association between host populations and specific M. tuberculosis lineages and/or social interactions that are shaped by shared cultural and geographic histories. Regarding the congruence between human and M. tuberculosis phylogenies, a study relying on M. tuberculosis and human Y chromosome DNA sequences to formally assess the correlation between them, concluded that they are not congruent. Also, a more recent study which included genome sequences from M. tuberculosis complex members extracted from three 1,000 year old Peruvian mummies, estimated that the most recent common ancestor of the M. tuberculosis complex lived only 4,000 – 6,000 years ago. The M. tuberculosis evolutionary rate estimated by the Bos et al study  is also supported by a study on Lineage 4 relying on genomic aDNA sequences from Hungarian mummies more than 200 years old. In total, the evidence thus favors this more recent estimate of the age of the MTBC most recent common ancestor, and thus that the global evolution and dispersal of M. tuberculosis has occurred over the last 4,000–6,000 years. Among the seven recognized lineages of M. tuberculosis, only two are truly global in their distribution: Lineages 2 and 4. Among these, Lineage 4 is most well dispersed, and is e.g. almost totally dominating in the Americas. Lineage 4 was shown to have evolved in or in the vicinity of Europe, and to have spread globally with Europeans starting around the 13th century. This study also found that Lineage 4 tuberculosis spread to the Americas shortly after the European discovery of the continent in 1492, and suggests that this represented the first introduction of human TB on the continent (although animal strains have been found in human remains predating Columbus. Similarly, Lineage 4 was found to have spread from Europe to Africa during the Age of Discovery, starting in the early 15th century. Similarly, Lineage 2 was introduced from Asia to Africa multiple times during the past 300 years. M. tuberculosis thus likely evolved in Africa but the two globally distributed lineages evolved later; Lineage 2 in East Asia and Lineage 4 in or around Europe, and has dispersed across the globe from there. It has been suggested that ancestral mycobacteria may have impacted early hominids in East Africa as early as three million years ago. Even though the MRCA of extant M. tuberculosis seems to have existed as recently as 4,000-6,000 years ago, this does not necessarily suggest that TB did not exist prior to that, it merely means that all M. tuberculosis strains circulating today can be traced back to a common ancestor that lived at that point in time. M tuberculosis is a clonal organism and does not exchange DNA via horizontal gene transfer. This, possibly combined with a relatively low rate of evolution, might explain why the evolution of resistance has been relatively slow in the species compared to some other major bacterial pathogens. However, ABR is a very serious and growing challenge. Worst hit are countries in the former Soviet republics, where ABR evolved and spread at explosive levels following the fall of the Soviet Union. An extreme example is Belarus, where a third of all new cases of tuberculosis are multidrug-resistant. Multidrug-resistant tuberculosis requires prolonged treatment with expensive and often toxic drugs, and treatment failure is common. The nature of the host-pathogen interaction between humans and M. tuberculosis is considered to have a genetic component. A group of rare disorders called Mendelian susceptibility to mycobacterial diseases was observed in a subset of individuals with a genetic defect that results in increased susceptibility to mycobacterial infection. Early case and twin studies have indicated that genetic component are important in host susceptibility to M. tuberculosis. Recent genome-wide association studies (GWAS) have identified three genetic risk loci, including at positions 11p13 and 18q11. As is common in GWAS, the variants discovered have moderate effect sizes. As an intracellular pathogen, M. tuberculosis is exposed to a variety of DNA-damaging assaults, primarily from host-generated antimicrobial toxic radicals. Exposure to reactive oxygen species and/or reactive nitrogen species causes different types of DNA damage including oxidation, depurination, methylation, and deamination that can give rise to single- and double-strand breaks (DSBs). DnaE2 polymerase is upregulated in M. tuberculosis by several DNA-damaging agents, as well as during infection of mice. Loss of this DNA polymerase reduces the virulence of M. tuberculosis in mice. DnaE2 is an error-prone repair DNA repair polymerase that appears to contribute to M. tuberculosis survival during infection. The two major pathways employed in repair of DSBs are homologous recombinational repair (HR) and nonhomologous end joining (NHEJ). Macrophage-internalized M. tuberculosis is able to persist if either of these pathways is defective, but is attenuated when both pathways are defective. This indicates that intracellular exposure of M. tuberculosis to reactive oxygen and/or reactive nitrogen species results in the formation of DSBs that are repaired by HR or NHEJ. However deficiency of DSB repair does not appear to impair M. tuberculosis virulence in animal models. M. tuberculosis, then known as the "tubercle bacillus", was first described on 24 March 1882 by Robert Koch, who subsequently received the Nobel Prize in Physiology or Medicine for this discovery in 1905; the bacterium is also known as "Koch's bacillus". Tuberculosis has existed throughout history, but the name has changed frequently over time. In 1720, though, the history of tuberculosis started to take shape into what is known of it today; as the physician Benjamin Marten described in his A Theory of Consumption, tuberculosis may be caused by small living creatures transmitted through the air to other patients. The BCG vaccine, which was derived from M. bovis, has had limited success in preventing tuberculosis. ^ Gordon SV, Parish T (April 2018). "Microbe Profile: Mycobacterium tuberculosis: Humanity's deadly microbial foe". Microbiology. 164 (4): 437–439. doi:10.1099/mic.0.000601. PMID 29465344. ^ a b Ryan KJ, Ray CG (2004). "Mycobacteria". Sherris Medical Microbiology : an Introduction to Infectious Diseases (4th ed.). New York: McGraw-Hill. p. 439. ISBN 978-0-83-858529-0. ^ Fu LM, Fu-Liu CS (1 January 2002). "Is Mycobacterium tuberculosis a closer relative to Gram-positive or Gram-negative bacterial pathogens?". Tuberculosis. 82 (2–3): 85–90. doi:10.1054/tube.2002.0328. PMID 12356459. ^ a b Cudahy P, Shenoi SV (April 2016). "Diagnostics for pulmonary tuberculosis". Postgraduate Medical Journal. 92 (1086): 187–93. doi:10.1136/postgradmedj-2015-133278. PMC 4854647. PMID 27005271. ^ Cole ST, Brosch R, Parkhill J, Garnier T, Churcher C, Harris D, Gordon SV, Eiglmeier K, Gas S, Barry CE, Tekaia F, Badcock K, Basham D, Brown D, Chillingworth T, Connor R, Davies R, Devlin K, Feltwell T, Gentles S, Hamlin N, Holroyd S, Hornsby T, Jagels K, Krogh A, McLean J, Moule S, Murphy L, Oliver K, Osborne J, Quail MA, Rajandream MA, Rogers J, Rutter S, Seeger K, Skelton J, Squares R, Squares S, Sulston JE, Taylor K, Whitehead S, Barrell BG (June 1998). "Deciphering the biology of Mycobacterium tuberculosis from the complete genome sequence". Nature. 393 (6685): 537–44. Bibcode:1998Natur.393..537C. doi:10.1038/31159. PMID 9634230. ^ Camus JC, Pryor MJ, Médigue C, Cole ST (October 2002). "Re-annotation of the genome sequence of Mycobacterium tuberculosis H37Rv". Microbiology. 148 (Pt 10): 2967–73. doi:10.1099/00221287-148-10-2967. PMID 12368430. ^ van Ingen J, Rahim Z, Mulder A, Boeree MJ, Simeone R, Brosch R, van Soolingen D (April 2012). "Characterization of Mycobacterium orygis as M. tuberculosis complex subspecies". Emerging Infectious Diseases. 18 (4): 653–5. doi:10.3201/eid1804.110888. PMC 3309669. PMID 22469053. ^ a b c Fitzgerald DW, Sterline TR, Haas DW (1 January 2015). "251-Mycobacterium tuberculosis". In Bennett JE, Dolin R, Blaser MJ (eds.). Mandell, Douglas, and Bennett's principles and practice of infectious diseases. Elsevier Saunders. p. 2787. ISBN 978-1-4557-4801-3. OCLC 903327877. ^ Todar K. "Mycobacterium tuberculosis and Tuberculosis". textbookofbacteriology.net. Retrieved 24 December 2016. ^ McMurray, David N. (1 January 1996). Baron, Samuel (ed.). Medical Microbiology (4th ed.). Galveston (TX): University of Texas Medical Branch at Galveston. ISBN 978-0963117212. PMID 21413269. ^ Bicmen C, Gunduz AT, Coskun M, Senol G, Cirak AK, Ozsoz A (August 2011). "Molecular detection and identification of mycobacterium tuberculosis complex and four clinically important nontuberculous mycobacterial species in smear-negative clinical samples by the genotype mycobacteria direct test". Journal of Clinical Microbiology. 49 (8): 2874–8. doi:10.1128/JCM.00612-11. PMC 3147717. PMID 21653780. ^ Saleeb PG, Drake SK, Murray PR, Zelazny AM (May 2011). "Identification of mycobacteria in solid-culture media by matrix-assisted laser desorption ionization-time of flight mass spectrometry". Journal of Clinical Microbiology. 49 (5): 1790–4. doi:10.1128/JCM.02135-10. PMC 3122647. PMID 21411597. ^ "How TB Spreads". Center for Disease Control. Retrieved 14 March 2018. ^ Keane J, Balcewicz-Sablinska MK, Remold HG, Chupp GL, Meek BB, Fenton MJ, Kornfeld H (January 1997). "Infection by Mycobacterium tuberculosis promotes human alveolar macrophage apoptosis". Infection and Immunity. 65 (1): 298–304. PMC 174591. PMID 8975927. ^ Bell E (October 2005). "Vaccines: A souped-up version of BCG". Nature Reviews Immunology. 5 (10): 746. doi:10.1038/nri1720. ^ Mann FM, Xu M, Chen X, Fulton DB, Russell DG, Peters RJ (December 2009). "Edaxadiene: a new bioactive diterpene from Mycobacterium tuberculosis". Journal of the American Chemical Society. 131 (48): 17526–7. doi:10.1021/ja9019287. PMC 2787244. PMID 19583202. ^ Flynn JL, Chan J (August 2003). "Immune evasion by Mycobacterium tuberculosis: living with the enemy". Current Opinion in Immunology. 15 (4): 450–5. doi:10.1016/S0952-7915(03)00075-X. PMID 12900278. ^ Saunders BM, Cooper AM (August 2000). "Restraining mycobacteria: role of granulomas in mycobacterial infections". Immunology and Cell Biology. 78 (4): 334–41. doi:10.1046/j.1440-1711.2000.00933.x. PMID 10947857. ^ Wooldridge K, ed. (2009). Bacterial Secreted Proteins: Secretory Mechanisms and Role in Pathogenesis. Caister Academic Press. ISBN 978-1-904455-42-4. ^ Zhang Y, Mazurek GH, Cave MD, Eisenach KD, Pang Y, Murphy DT, Wallace RJ (June 1992). "DNA polymorphisms in strains of Mycobacterium tuberculosis analyzed by pulsed-field gel electrophoresis: a tool for epidemiology". Journal of Clinical Microbiology. 30 (6): 1551–6. PMC 265327. PMID 1352518. ^ Frothingham R, Meeker-O'Connell WA (May 1998). "Genetic diversity in the Mycobacterium tuberculosis complex based on variable numbers of tandem DNA repeats". Microbiology. 144 ( Pt 5) (Pt 5): 1189–96. doi:10.1099/00221287-144-5-1189. PMID 9611793. ^ Mazars E, Lesjean S, Banuls AL, Gilbert M, Vincent V, Gicquel B, Tibayrenc M, Locht C, Supply P (February 2001). "High-resolution minisatellite-based typing as a portable approach to global analysis of Mycobacterium tuberculosis molecular epidemiology". Proceedings of the National Academy of Sciences of the United States of America. 98 (4): 1901–6. Bibcode:2001PNAS...98.1901M. doi:10.1073/pnas.98.4.1901. PMC 29354. PMID 11172048. ^ Hawkey PM, Smith EG, Evans JT, Monk P, Bryan G, Mohamed HH, Bardhan M, Pugh RN (August 2003). "Mycobacterial interspersed repetitive unit typing of Mycobacterium tuberculosis compared to IS6110-based restriction fragment length polymorphism analysis for investigation of apparently clustered cases of tuberculosis". Journal of Clinical Microbiology. 41 (8): 3514–20. doi:10.1128/JCM.41.8.3514-3520.2003. PMC 179797. PMID 12904348. ^ Supply P, Allix C, Lesjean S, Cardoso-Oelemann M, Rüsch-Gerdes S, Willery E, Savine E, de Haas P, van Deutekom H, Roring S, Bifani P, Kurepina N, Kreiswirth B, Sola C, Rastogi N, Vatin V, Gutierrez MC, Fauville M, Niemann S, Skuce R, Kremer K, Locht C, van Soolingen D (December 2006). "Proposal for standardization of optimized mycobacterial interspersed repetitive unit-variable-number tandem repeat typing of Mycobacterium tuberculosis". Journal of Clinical Microbiology. 44 (12): 4498–510. doi:10.1128/JCM.01392-06. PMC 1698431. PMID 17005759. ^ Müller, Romy; Roberts, Charlotte A.; Brown, Terence A. (2015). "Complications in the study of ancient tuberculosis: non-specificity of IS6110 PCRs". Science and Technology of Archaeological Research. 1 (1): STAR20141120548. doi:10.1179/2054892314Y.0000000002. ^ Rattan A, Kalia A, Ahmad N (June 1998). "Multidrug-resistant Mycobacterium tuberculosis: molecular perspectives". Emerging Infectious Diseases. 4 (2): 195–209. doi:10.3201/eid0402.980207. PMC 2640153. PMID 9621190. ^ "Drug-resistant TB". Center for Disease Control. April 2014. ^ Cole ST, Brosch R, Parkhill J, Garnier T, Churcher C, Harris D, et al. (June 1998). "Deciphering the biology of Mycobacterium tuberculosis from the complete genome sequence". Nature. 393 (6685): 537–44. Bibcode:1998Natur.393..537C. doi:10.1038/31159. PMID 9634230. 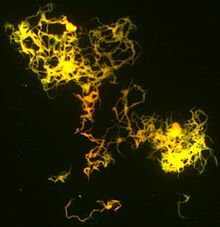 ^ "Mycobacterium tuberculosis". Sanger Institute. 29 March 2007. Retrieved 16 November 2008. ^ Bloch H, Segal W (August 1956). "Biochemical differentiation of Mycobacterium tuberculosis grown in vivo and in vitro". Journal of Bacteriology. 72 (2): 132–41. PMC 357869. PMID 13366889. ^ Wipperman MF, Sampson NS, Thomas ST (2014). "Pathogen roid rage: cholesterol utilization by Mycobacterium tuberculosis". Critical Reviews in Biochemistry and Molecular Biology. 49 (4): 269–93. doi:10.3109/10409238.2014.895700. PMC 4255906. PMID 24611808. ^ Glickman MS, Jacobs WR (February 2001). "Microbial pathogenesis of Mycobacterium tuberculosis: dawn of a discipline". Cell. 104 (4): 477–85. doi:10.1016/S0092-8674(01)00236-7. PMID 11239406. ^ Arnvig KB, Young DB (August 2009). "Identification of small RNAs in Mycobacterium tuberculosis". Molecular Microbiology. 73 (3): 397–408. doi:10.1111/j.1365-2958.2009.06777.x. PMC 2764107. PMID 19555452. ^ Livny J, Brencic A, Lory S, Waldor MK (2006). "Identification of 17 Pseudomonas aeruginosa sRNAs and prediction of sRNA-encoding genes in 10 diverse pathogens using the bioinformatic tool sRNAPredict2". Nucleic Acids Research. 34 (12): 3484–93. doi:10.1093/nar/gkl453. PMC 1524904. PMID 16870723. ^ Zhang H, Li D, Zhao L, Fleming J, Lin N, Wang T, Liu Z, Li C, Galwey N, Deng J, Zhou Y, Zhu Y, Gao Y, Wang T, Wang S, Huang Y, Wang M, Zhong Q, Zhou L, Chen T, Zhou J, Yang R, Zhu G, Hang H, Zhang J, Li F, Wan K, Wang J, Zhang XE, Bi L (October 2013). "Genome sequencing of 161 Mycobacterium tuberculosis isolates from China identifies genes and intergenic regions associated with drug resistance". Nature Genetics. 45 (10): 1255–60. doi:10.1038/ng.2735. PMID 23995137. ^ a b Blouin Y, Hauck Y, Soler C, Fabre M, Vong R, Dehan C, Cazajous G, Massoure PL, Kraemer P, Jenkins A, Garnotel E, Pourcel C, Vergnaud G (2012). "Significance of the identification in the Horn of Africa of an exceptionally deep branching Mycobacterium tuberculosis clade". PLOS One. 7 (12): e52841. Bibcode:2012PLoSO...752841B. doi:10.1371/journal.pone.0052841. PMC 3531362. PMID 23300794. ^ a b c Comas I, Coscolla M, Luo T, Borrell S, Holt KE, Kato-Maeda M, Parkhill J, Malla B, Berg S, Thwaites G, Yeboah-Manu D, Bothamley G, Mei J, Wei L, Bentley S, Harris SR, Niemann S, Diel R, Aseffa A, Gao Q, Young D, Gagneux S (October 2013). "Out-of-Africa migration and Neolithic coexpansion of Mycobacterium tuberculosis with modern humans". Nature Genetics. 45 (10): 1176–82. doi:10.1038/ng.2744. PMC 3800747. PMID 23995134. ^ Blouin Y, Cazajous G, Dehan C, Soler C, Vong R, Hassan MO, Hauck Y, Boulais C, Andriamanantena D, Martinaud C, Martin É, Pourcel C, Vergnaud G (January 2014). "Progenitor "Mycobacterium canettii" clone responsible for lymph node tuberculosis epidemic, Djibouti". Emerging Infectious Diseases. 20 (1): 21–8. doi:10.3201/eid2001.130652. PMC 3884719. PMID 24520560. ^ a b Galagan JE (May 2014). "Genomic insights into tuberculosis". Nature Reviews. Genetics. 15 (5): 307–20. doi:10.1038/nrg3664. PMID 24662221. ^ Malm S, Linguissi LS, Tekwu EM, Vouvoungui JC, Kohl TA, Beckert P, Sidibe A, Rüsch-Gerdes S, Madzou-Laboum IK, Kwedi S, Penlap Beng V, Frank M, Ntoumi F, Niemann S (March 2017). "New Mycobacterium tuberculosis Complex Sublineage, Brazzaville, Congo". Emerging Infectious Diseases. 23 (3): 423–429. doi:10.3201/eid2303.160679. PMC 5382753. PMID 28221129. ^ Wirth T, Hildebrand F, Allix-Béguec C, Wölbeling F, Kubica T, Kremer K, van Soolingen D, Rüsch-Gerdes S, Locht C, Brisse S, Meyer A, Supply P, Niemann S (September 2008). "Origin, spread and demography of the Mycobacterium tuberculosis complex". PLoS Pathogens. 4 (9): e1000160. doi:10.1371/journal.ppat.1000160. PMC 2528947. PMID 18802459. ^ Eldholm V, Pettersson JH, Brynildsrud OB, Kitchen A, Rasmussen EM, Lillebaek T, Rønning JO, Crudu V, Mengshoel AT, Debech N, Alfsnes K, Bohlin J, Pepperell CS, Balloux F (November 2016). "Armed conflict and population displacement as drivers of the evolution and dispersal of Mycobacterium tuberculosis". Proceedings of the National Academy of Sciences of the United States of America. 113 (48): 13881–13886. doi:10.1073/pnas.1611283113. PMC 5137683. PMID 27872285. ^ Gagneux S, DeRiemer K, Van T, Kato-Maeda M, de Jong BC, Narayanan S, Nicol M, Niemann S, Kremer K, Gutierrez MC, Hilty M, Hopewell PC, Small PM (February 2006). "Variable host-pathogen compatibility in Mycobacterium tuberculosis". Proceedings of the National Academy of Sciences of the United States of America. 103 (8): 2869–73. Bibcode:2006PNAS..103.2869G. doi:10.1073/pnas.0511240103. PMC 1413851. PMID 16477032. ^ Hirsh AE, Tsolaki AG, DeRiemer K, Feldman MW, Small PM (April 2004). "Stable association between strains of Mycobacterium tuberculosis and their human host populations". Proceedings of the National Academy of Sciences of the United States of America. 101 (14): 4871–6. doi:10.1073/pnas.0305627101. PMC 387341. PMID 15041743. ^ Pepperell CS, Casto AM, Kitchen A, Granka JM, Cornejo OE, Holmes EC, Holmes EC, Birren B, Galagan J, Feldman MW (August 2013). "The role of selection in shaping diversity of natural M. tuberculosis populations". PLoS Pathogens. 9 (8): e1003543. doi:10.1371/journal.ppat.1003543. PMC 3744410. PMID 23966858. ^ a b c Bos KI, Harkins KM, Herbig A, Coscolla M, Weber N, Comas I, Forrest SA, Bryant JM, Harris SR, Schuenemann VJ, Campbell TJ, Majander K, Wilbur AK, Guichon RA, Wolfe Steadman DL, Cook DC, Niemann S, Behr MA, Zumarraga M, Bastida R, Huson D, Nieselt K, Young D, Parkhill J, Buikstra JE, Gagneux S, Stone AC, Krause J (October 2014). "Pre-Columbian mycobacterial genomes reveal seals as a source of New World human tuberculosis". Nature. 514 (7523): 494–7. Bibcode:2014Natur.514..494B. doi:10.1038/nature13591. PMC 4550673. PMID 25141181. ^ Kay GL, Sergeant MJ, Zhou Z, Chan JZ, Millard A, Quick J, Szikossy I, Pap I, Spigelman M, Loman NJ, Achtman M, Donoghue HD, Pallen MJ (April 2015). "Eighteenth-century genomes show that mixed infections were common at time of peak tuberculosis in Europe". Nature Communications. 6 (1): 6717. Bibcode:2015NatCo...6E6717K. doi:10.1038/ncomms7717. PMC 4396363. PMID 25848958. ^ a b Brynildsrud OB, Pepperell CS, Suffys P, Grandjean L, Monteserin J, Debech N, Bohlin J, Alfsnes K, Pettersson JO, Kirkeleite I, Fandinho F, da Silva MA, Perdigao J, Portugal I, Viveiros M, Clark T, Caws M, Dunstan S, Thai PV, Lopez B, Ritacco V, Kitchen A, Brown TS, van Soolingen D, O'Neill MB, Holt KE, Feil EJ, Mathema B, Balloux F, Eldholm V (October 2018). "Mycobacterium tuberculosis lineage 4 shaped by colonial migration and local adaptation". Science Advances. 4 (10): eaat5869. doi:10.1126/sciadv.aat5869. PMC 6192687. PMID 30345355. ^ Rutaihwa, Liliana K.; Menardo, Fabrizio; Stucki, David; Gygli, Sebastian M.; Ley, Serey D.; Malla, Bijaya; Feldmann, Julia; Farnov, Sonia Borrell; Beisel, Christian (10 September 2018). "Multiple Introductions of the Mycobacterium tuberculosis Lineage 2 Beijing into Africa over centuries". bioRxiv: 413039. doi:10.1101/413039. ^ O'Neill, Mary B.; Shockey, Abigail C.; Zarley, Alex; Aylward, William; Eldholm, Vegard; Kitchen, Andrew; Pepperell, Caitlin S. (1 August 2018). "Lineage specific histories of Mycobacterium tuberculosis dispersal in Africa and Eurasia". bioRxiv: 210161. doi:10.1101/210161. ^ Gutierrez MC, Brisse S, Brosch R, Fabre M, Omaïs B, Marmiesse M, Supply P, Vincent V (September 2005). "Ancient origin and gene mosaicism of the progenitor of Mycobacterium tuberculosis". PLoS Pathogens. 1 (1): e5. doi:10.1371/journal.ppat.0010005. PMC 1238740. PMID 16201017. ^ Eldholm V, Balloux F (August 2016). "Antimicrobial Resistance in Mycobacterium tuberculosis: The Odd One Out". Trends in Microbiology. 24 (8): 637–648. doi:10.1016/j.tim.2016.03.007. PMID 27068531. ^ Skrahina A, Hurevich H, Zalutskaya A, Sahalchyk E, Astrauko A, Hoffner S, Rusovich V, Dadu A, de Colombani P, Dara M, van Gemert W, Zignol M (January 2013). "Multidrug-resistant tuberculosis in Belarus: the size of the problem and associated risk factors". Bulletin of the World Health Organization. 91 (1): 36–45. doi:10.2471/BLT.12.104588. PMC 3537245. PMID 23397349. ^ Bustamante J, Boisson-Dupuis S, Abel L, Casanova JL (December 2014). "Mendelian susceptibility to mycobacterial disease: genetic, immunological, and clinical features of inborn errors of IFN-γ immunity". Seminars in Immunology. 26 (6): 454–70. doi:10.1016/j.smim.2014.09.008. PMC 4357480. PMID 25453225. ^ Thye T, Owusu-Dabo E, Vannberg FO, van Crevel R, Curtis J, Sahiratmadja E, Balabanova Y, Ehmen C, Muntau B, Ruge G, Sievertsen J, Gyapong J, Nikolayevskyy V, Hill PC, Sirugo G, Drobniewski F, van de Vosse E, Newport M, Alisjahbana B, Nejentsev S, Ottenhoff TH, Hill AV, Horstmann RD, Meyer CG (February 2012). "Common variants at 11p13 are associated with susceptibility to tuberculosis". Nature Genetics. 44 (3): 257–9. doi:10.1038/ng.1080. PMC 3427019. PMID 22306650. ^ Thye T, Vannberg FO, Wong SH, Owusu-Dabo E, Osei I, Gyapong J, Sirugo G, Sisay-Joof F, Enimil A, Chinbuah MA, Floyd S, Warndorff DK, Sichali L, Malema S, Crampin AC, Ngwira B, Teo YY, Small K, Rockett K, Kwiatkowski D, Fine PE, Hill PC, Newport M, Lienhardt C, Adegbola RA, Corrah T, Ziegler A, Morris AP, Meyer CG, Horstmann RD, Hill AV (September 2010). "Genome-wide association analyses identifies a susceptibility locus for tuberculosis on chromosome 18q11.2". Nature Genetics. 42 (9): 739–741. doi:10.1038/ng.639. PMC 4975513. PMID 20694014. ^ a b Boshoff HI, Reed MB, Barry CE, Mizrahi V (April 2003). "DnaE2 polymerase contributes to in vivo survival and the emergence of drug resistance in Mycobacterium tuberculosis". Cell. 113 (2): 183–93. doi:10.1016/s0092-8674(03)00270-8. PMID 12705867. ^ a b Brzostek A, Szulc I, Klink M, Brzezinska M, Sulowska Z, Dziadek J (2014). "Either non-homologous ends joining or homologous recombination is required to repair double-strand breaks in the genome of macrophage-internalized Mycobacterium tuberculosis". PLOS One. 9 (3): e92799. Bibcode:2014PLoSO...992799B. doi:10.1371/journal.pone.0092799. PMC 3962454. PMID 24658131. ^ Heaton BE, Barkan D, Bongiorno P, Karakousis PC, Glickman MS (August 2014). "Deficiency of double-strand DNA break repair does not impair Mycobacterium tuberculosis virulence in multiple animal models of infection". Infection and Immunity. 82 (8): 3177–85. doi:10.1128/IAI.01540-14. PMC 4136208. PMID 24842925. ^ "Robert Koch and Tuberculosis: Koch's Famous Lecture". Nobel Foundation. 2008. Retrieved 18 November 2008. ^ "Tuberculosis History Timeline". Archived from the original on 21 June 2010. Retrieved 18 June 2010. Wikimedia Commons has media related to Mycobacterium tuberculosis. Scholia has a topic profile for Mycobacterium tuberculosis. "Mycobacterium tuberculosis". NCBI Taxonomy Browser. This page was last edited on 2 April 2019, at 23:56 (UTC).